Those who filed the case are members of Talent Association of GMA 7 (TAG). The network used the term “talents” to describe skilled professionals working on a per show basis. Talents include executive producers, associate producers, segment producers, writers, researchers, edit supervisors, production coordinators, transcribers, and crew members of various programs’ technical teams. The TV giant insists that talents are ‘independent contractors’ and that there is no employer-employee relationship between the network and its talents. According to the resolution, the burden of proving they are ‘independent contractors’ and not employees lies on GMA. Excerpt from the NLRC resolution. The resolution explains that ‘a person can be considered an independent contractor when 1) he has substantial capital or investment in the work or service which he was hired; (2) he does not perform activities, which are directly related to the principal’s business and (3) he has control over the means and methods by which the work should be done. However, the NLRC ruled that GMA failed to prove the talents are indeed ‘independent contractors’. The document further stated, ‘Having worked for several years and/or considering that their work is an integral part of GMA’s television program, complainants are undoubtedly regular employees of GMA’. 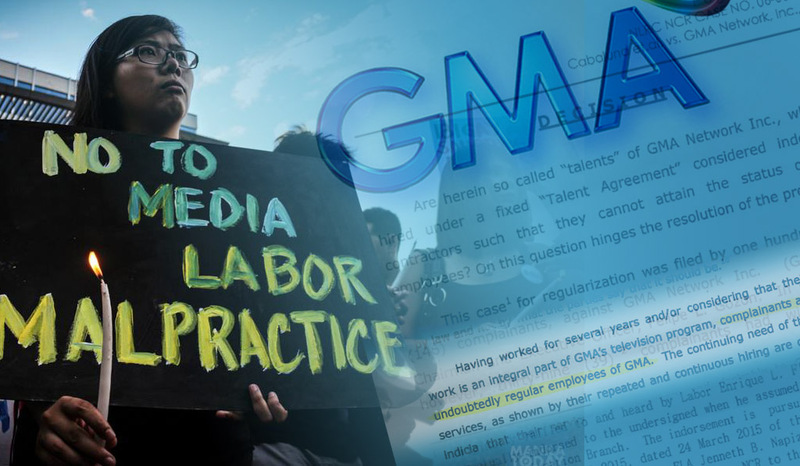 GMA later crafted the Project Employment Contract (PEC) as replacement to talent agreements, while the decision on the regularization case was still pending last year. “With the PEC, the network giant would like to erase the employment history of the media workers,” said TAG president Christian Cabaluna. “For example, a talent has been working for GMA for 10 years, if he signed the PEC and he wanted to obtain a certificate of employment, the PEC would make it seem as if the talent has been with the network only during the year the contract is in effect,” explained Cabaluna. According to Cabaluna, the employment contracts such as the PEC are suited for the construction business and not for the media. “The PEC is crafted with the intention of circumventing existing labor laws,” said Cabaluna. However, some talents signed the PEC. “Even if some of our members already signed the PEC contract, this doesn’t mean they are excluded in our victory,” added Cabaluna. TAG is waiting for the next move by GMA. The TV network has ten days to file an appeal against the ruling. Manila Today emailed GMA-7 management for comments regarding the issue. There is still no reply as of this posting.